Review by AllTheBestFights.com: 2018-11-10, good finish between Donald Cerrone and Mike Perry: it gets three stars (UFC Performance of the Night). The black belt in Brazilian jiu-jitsu and gaidojutsu Donald Cerrone entered this fight with a pro mma record of 33-11-0 (76% finishing rate) and he is ranked as the No.16 welterweight in the world but he won just one out of his last five bouts, against Yancy Medeiros in February (Donald Cerrone vs Yancy Medeiros); after this fight ‘Cowboy’ has lost to Leon Edwards (Donald Cerrone vs Leon Edwards). His opponent, Mike Perry, has a record of 12-3-0 (92% ko/tko victory rate – he has never won via submission) and he entered as the No.25 in the same weight class but he lost two out of his last three fights, against Santiago Ponzinibbio in 2017 (Santiago Ponzinibbio vs Mike Perry) and Max Griffin in 2018 (Mike Perry vs Max Griffin); after this bout he has defeated Paul Felder (Paul Felder vs Mike Perry). 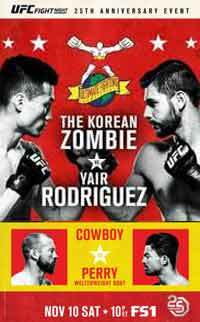 Cerrone vs Perry is on the undercard of Chan Sung Jung vs Yair Rodriguez – UFC Fight Night 139. Watch the video and rate this fight!